The term “submerged aquatic vegetation” (SAV) refers to all underwater flowering plants. In the San Francisco Estuary, SAV includes sago pondweed (Stuckenia pectinata, formerly Potamogeton pectinatus), eelgrass (Zostera marina), and other species of seagrass, including the surfgrasses (Phyllospadix torreyi and P. scouleri), and widgeongrass (Ruppia maritima). Several freshwater plant species, mostly introduced, are found mainly in the delta (e.g., the Brazilian waterweed Egeria densa, an invasive nuisance species) and are outside of the geographic scope of this project. 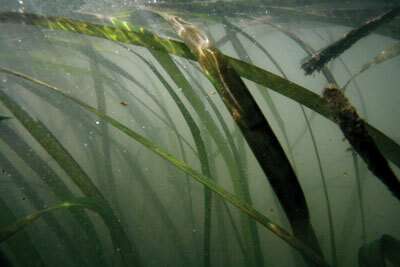 In San Francisco Bay, eelgrass is much more extensive than other SAV, and its role and restoration potential are understood better than for other SAV. 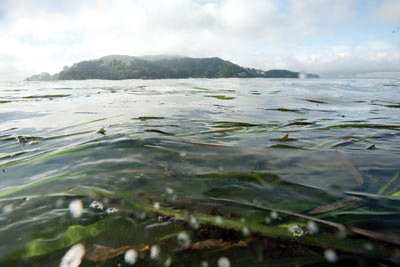 The largest eelgrass beds in the estuary are in shallow subtidal regions of San Pablo Bay and Richardson Bay, with smaller beds scattered in shallow areas mainly between Carquinez Strait and Hayward. The largest bed in the bay is located between Point San Pablo and Point Pinole, and contains about half of the total acreage. Threats to SAV in San Francisco Bay include activities associated with shipping and boating, which can disrupt seagrass beds directly through destruction of plants by boat propellers, anchors and anchor chains, dredging, and construction of facilities (e.g., docks, harbors, breakwaters, ports). Indirect effects arise through increased suspended sediments due to dredging and boat wakes, or shading from structures such as docks. Hardening of the shoreline can reflect waves, increasing wave action and limiting or destroying beds. Most of these threats apply to eelgrass in the San Francisco Estuary but are focused in localized areas. To read more, download the submerged aquatic vegetation section of our report.